Photos by Jess Stryker. These Photos are Free to Use, Free to Download. No Sign Up Required, No Royalties! CC-BY-4.0 licensed. © Copyright 2001, Jess Stryker. CC-BY-4.0 License. Photo model release granted by Julie Stryker. 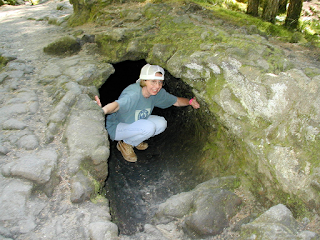 Trail of Two Forests, Julie Exiting Lava Tube. This lava cast was formed by lava flowing over a fallen tree trunk where it cooled. The tree burned out leaving a "cast." Gifford Pinchot National Forest, Washington, USA. This is Julie coming out of a tree lava tube. This is at Trail of Two Forests, south of Mt. St. Helens in Washington State. Kids will love this area, so be sure to stop and let them crawl through the tubes! No worries, there aren't any bears in them, too many people are crawling through them! You might want a flashlight, although we just crawled through, feeling our way with our hands in the complete darkness. Three Burned Trees Surrounded by Wildflowers. Historic Hotels & Lodges. Photo essays on famous, and not so famous, historic hotels and lodges. Irrigation Tutorials. Sprinkler Warehouse provides a huge collection of free online tutorials on landscape irrigation. Most of the articles were written by Jess Stryker. Landscape & Home Tutorials. How to articles on home repairs and landscapes. The above photos/images by Jess Stryker are licensed under a Creative Commons Attribution 4.0 International License. Website & Text © Copyright 2006-2019, Jess Stryker. All rights reserved.